jackets. Anyway, this system is very winter-like. The front comes through and we get fair skies followed by clouds as the jet stream dives down. Then as it lifts out, the clouds go away and we then start to rebound in the temperature department. In the winter, often when the clouds roll in following the front, we get snow flurries. In this case we won’t get any precipitation. Look for us to get to the mid 40’s by midday on Monday then we don’t go a whole lot higher due to the clouds. In spite of the clouds, we still go to freezing or below on Monday night and then the clouds start to break up on Tuesday afternoon. A relatively clear night on Tuesday night should send everyone down below freezing before we warm up quickly for the latter half of the week. There is a Freeze Watch for the entire viewing area Tuesday morning. Bring in the plants if you want to save them for a little longer. A DAY OF FIRSTS ON THIS DATE IN HISTORY!!! On this date in 1659, two men gained infamy in the Boston Commons as the first Quakers executed in the New World for their religious beliefs. Mary Dyer and William Leddra soon followed. After that, those who were sentenced to death had their sentences commuted to simply being whipped out of the colony. Marmaduke Stevenson and William Robinson had left England to seek freedom of religion. 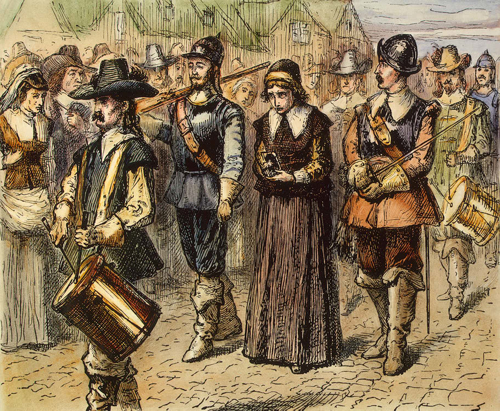 Their first mistake was to settle in the Massachusetts Colony where the Religious Society of Friends, the formal name of Quakers, was banned with the punishment of practicing their Faith being death by hanging. Seems that the Quakers opposed a central church authority and preferred to seek spiritual counseling through local Quaker meetings. They stood for a truely egalitarian society in which there was equality between men and women and they opposed the notion of slavery. Oh…such dastardly people those Quakers. Robinson and Stevenson left a legacy of staying out of Massachusetts as others who followed found refuge in Rhode Island and other colonies. But, the legacy of Massachusetts lives on. While we are taught in school that Massachusetts was the cradle of liberty, we must remember the fate of the Quakers, those who were to be bussed to get equal access to schools in the early 1970’s, the tax system in the Commonwealth and of course, all of the anti-global warming folks who opposed windmills off the coast of Cape Cod because the clean-energy devices spoiled their view. Yes, indeed. Quite a history of freedom in the Commonwealth of Massachusetts. So Much for the Free Range: On this date in 1873, Joseph Glidden applied for a patent on his version of barbed wire. He had seen the barbed wire of Henry Rose at the DeKalb County Illinois State Fair but he was not impressed. He came up with a new design that used two wires to hold the barbs firmly in place. His proved to be the first to be mass produced and his inexpensive wire fencing was up to 80 million pounds in production by 1880. By making it available to farmers en masse on the plains, it effectively brought to an end the big cattle drives because ranchers driving their cattle to market suddenly found their routes cut off by barbed wire fencing all across the plains. It all started on this date in 1946. Geographically Speaking debuted as a travel show on TV. It showed travel films. It was about as exciting to viewers then then as it would be today as it only ran until Dec. 1, 1946. Real clunker. But, it was the first TV show to have a sponsor, Bristol-Meyers. And we’ve had commercials on TV ever since. Today with everyone having a remote, advertisers have had to get more creative in order to keep us from changing channels during commercials. It’s called zapping. We see an ad and “zap” we change channels. That’s why so much money is spent on ads for TV in production. We need to be entertained as well as informed. It doesn’t work with me when there are various sports on. Remember when cable TV first came out? 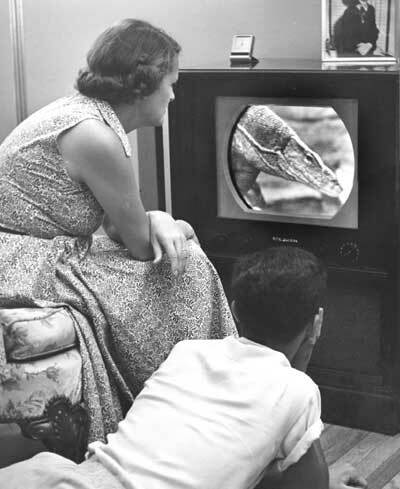 It was initially promoted as the public paying for TV so we wouldn’t see commercials any more. Well, that quickly evaporated. Many of the original cable TV outlets were “superstations.” We thought it was so cool getting a New York station and a Chicago station and of course Ted Turner’s WTBS. But we quickly realized we were paying to see shows with other areas commercials. Now, we pay for cable networks so we can see more commercials. Some time when you have nothing better to do, look at the Weather Channel and count how many minutes in an hour are devoted to weather and how many to commercials. You’ll be surprised. Then you will get mad when you realize you are paying for the privilege of watching all of those commercials. At least ESPN commercials are funny. So, now I have all of these “premium” channels that show no commercials and all movies. Of course it costs me another $15 a channel on top of the premium cable charge so I don’t have to watch commercials. It all began on this date in 1946 on a crummy show. But, without advertisers, I’d be out of a job so by all means, frequent all of our advertisers and watch their messages. In fact, I’d recommend that, when you are tuned in to another channel and they show a commercial, zap over to channel 32. Odds are the commercial is just as good as the one you were watching and you know the news that follows will be much better…especially the weather! movies have portrayed it. 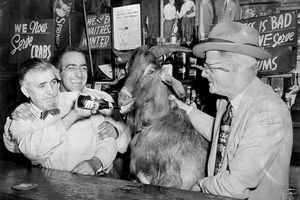 But, other sources claim that Ruth had demanded a double in his pay to $20,000 and the owner refused. 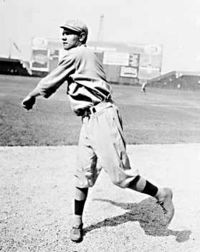 When he tried to trade him, the league president supposedly wanted to mess up Frazee’s enterprise and force him to sell so he talked most of the owners out of dealing with him. The White Sox though supposedly offered Shoeless Joe Jackson and $60,000 but the Yankees, who were terrible at the time, offered $100,000. Imagine what might have happened if Frazee took the White Sox deal? As it was, Frazee took the bigger wad of cash and the Red Sox never won another World Series until 2004. So, the team was cursed. But that’s not as good as the Cubs’ curse. World Series. 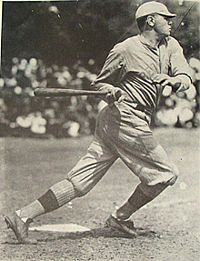 He was denied and he put a curse on the Cubs, who have not won a World Series since 1908. 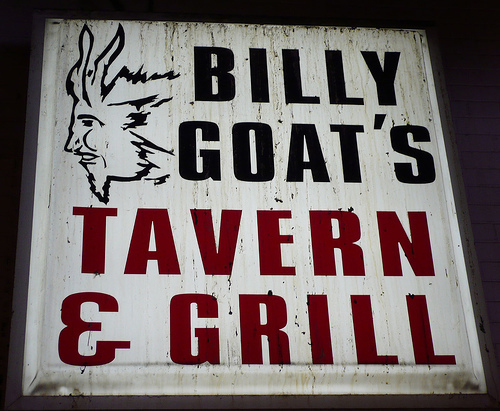 You can visit the Billy Goat Tavern on Lower Michigan Avenue right by the Wendella Boat Tours in Chicago. Get a cheese burger and ask for a coke and see what happens. Snow White went there and asked for fries. Try that out too. BTW, I hope the curse is never broken…Go Astros. This entry was posted on Monday, October 27th, 2008 at 4:36 am and is filed under Bob Symon, History, Louisville Forecast, Louisville Weather, Opinion, Science, Sports, This Date In History and Weather. Tagged: Babe Ruth, Barbed Wire, Billy Goat Curse, Billy Goat Tavern, Boston Red Sox, Boston Red Sox World Series Championship, Cattle Drives, Chicago Cubs, Commonwealth of Massachusetts, Curse of the Bambino, First commercial TV show, First TV Commercial, Joseph Glidden, Marmaduke Stevenson, Mary Dyer, NAM Forecast Model, Puritans, Quakers Executed, William Leddra, William Robinson. You can feed this entry. You can leave a response, or trackback from your own site. Great post. Living in England i have studies the barbaric punishments of so called witches. Luckily we live in the 21st century, otherwise i dont think my wife would still be here..
Amen to that Mr Symon. Might I add…..especially on the weekends, and on the rare occasion that that “other” guy is on vacation. When I was in graduate school for history, I took a class called “violence and war”. On the one hand I think the professor invented the class so that the graduate students might come up with some perspectives or research that may help his own work on his next book, it was extremely interesting…really interesting about the genesis of some things we have today. I’m sure that you are familiar with Guy Hawkes Day. The evolution of protest is interesting too. So good to hear from you.